It’s not if we grow, it’s how. 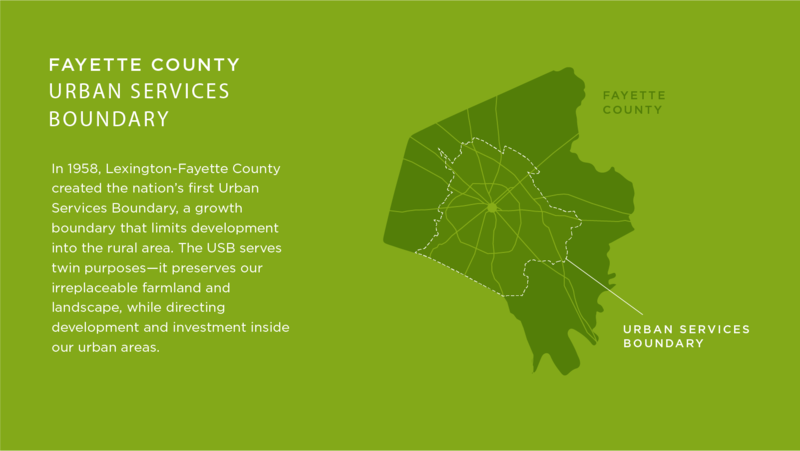 As Lexington evolves into a dynamic, vibrant city, it’s more important than ever that we continue to grow smart by striking a balance between innovative, responsible development and the protection of our irreplaceable Bluegrass farmland. The Urban Services Boundary forces city planners and developers to creatively use available land inside our city, as opposed to continually expanding outward into our signature Bluegrass farmland. By maintaining the USB, we can be balanced in our growth approach, develop in an innovative way, and continue to create a sustainable world-class city in a world-class landscape. We have plenty of room to grow. There are over 17,000 acres of vacant, undeveloped, and underutilized land inside the Urban Services Boundary. A smart growth strategy would continue to focus development, redevelopment, and investment inside our city limits so as to improve the quality of life of all our citizens.